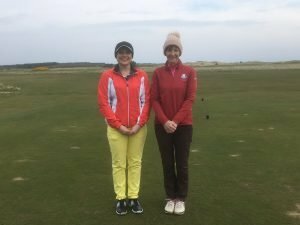 As many of you will be aware the annual US Kids European Championship is currently being run over a number of East Lothian courses. 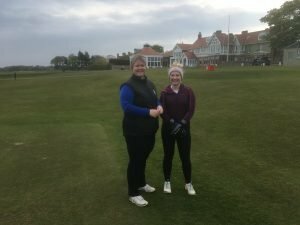 Grace Crawford one of our junior girls is taking part again this year and leads the field in the girl’s age 10 category after day 1 with a wonderful 66 over Royal Musselburgh. Well done Grace. 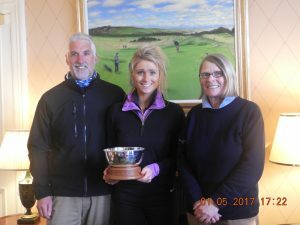 Congratulations to Annabel Hosie in being selected to play in the annual East v. West match for the Mhairi Mackay Trophy at Cochrane Castle Golf Club, Renfrewshire on Sunday. Sadly for us a very strong West team prevailed to retain the trophy again this year. 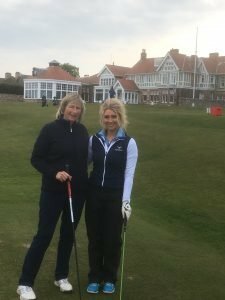 Annabel had her work cut for her from the start in her match with Jillian with a difference of 5 in their respective nhandicaps. 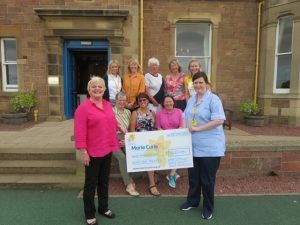 Diane Huish presented the cheque for £962 to Maggie Murdoch, one of the Marie Curie nurses who cared for Ros Thoresen at home before she died in February. Carrie Gray, lead nurse from the Marie Curie service and Juliet Williams from the North Berwick Marie Curie fundraising team were there along with Carol Murray, Carol Ross, Carol Mcleod, Gwen Stewart, Sue Penman and Jenni Ray. 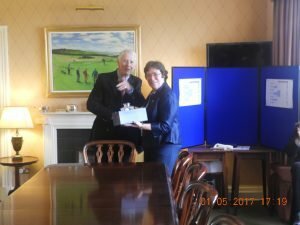 The Marie Curie team are very grateful to all the ladies from the county who bought tickets in the raffle, and to the golf clubs who so generously donated the prizes. Summer has arrived at last and we were all so pleased to be able to play in our shorts and polo shirts today at Longniddry. What a contrast to the rain at Gifford last year and the cold winds at Muirfield just a few weeks ago. 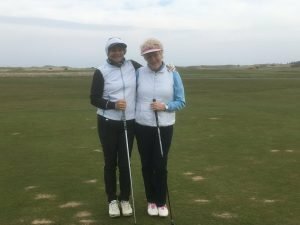 There were some good scores but some obviously were confused by the sun and lack of wind! The best five score qualify for the finals at Alyth on the 11th September. Details will be sent to the qualifiers in due course. Round 1 of the hole and hole is now complete and the results are attached. Round 2 must be played on or before 4th June. 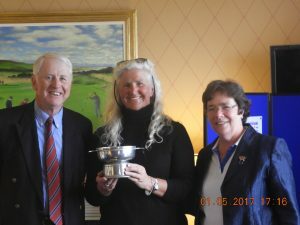 The Junior Spring Meeting and Championship was held at Winterfield today. Unfortunately “sunny Dunny” did not live up to its name and although it was sunny a few miles away the girls started in drizzle and although this did blow away it remained cold. 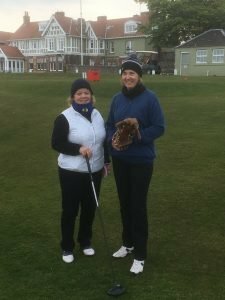 There was some good scoring despite the conditions and the fact that the girls did not know the course. This was also the nominated competition for The Telegraph Vitality Junior Championship and the winners names and scores go forward with the possibility of qualifying for the finals. Some golf balls courtesy of The Telegraph also go to the winners. 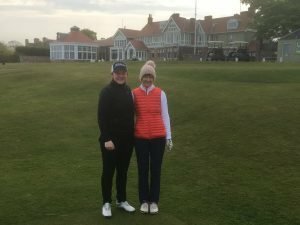 Congratulations to Grace Crawford and Emily Chapman for repeating last year’s results by winning the Scratch and Handicap Trophies respectively. 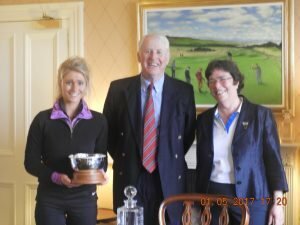 Congratulations also to Kate Crawford for taking 2nd Handicap. 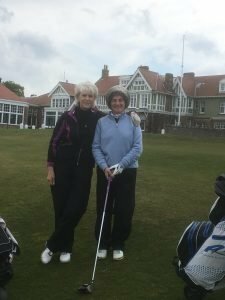 Enter soon to avoid disappointment – A reminder to all that the Babe Zaharias is being run jointly with Gullane Ladies GC again this year and is on Monday 21st August 2017 and will be played over Gullane No1. This is an open competition and entries are coming in steadily. If you are thinking of entering make sure you enter soon. 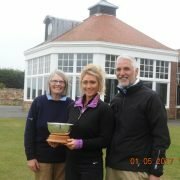 After a thrilling final that went all the way to the 21st hole Jill McNicoll emerged as the 2017 Champion. 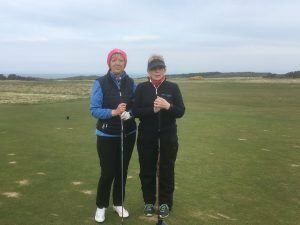 Congratulations go to Jill on winning but also to Kay Lannin who proved to be a very worthy runner up. 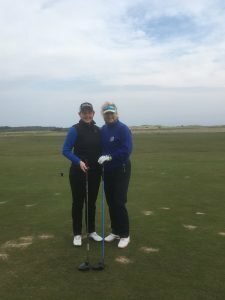 We were treated to some great golf and a match that swung back and forth. A full report and photos will be posted shortly.